We’ve encountered patients who become apprehensive whenever we recommend root canal therapy. However, we always tell them that there’s nothing to be worried about, because they’re in the hands of an excellent dentist, Dr. Kim C. Norman. A root canal may be regarded as a frightening dental procedure when in actuality; it does more good than harm. A root canal removes the infected pulp of a tooth; thereby, restoring its health and saving it from extraction. There are currently modern techniques and tools that make a root canal therapy a painless and comfortable procedure for every patient. Dr. Norman is aware that a lot of people are scared of having a root canal, so he takes great care in ensuring that the process is flawless and painless for the patient. 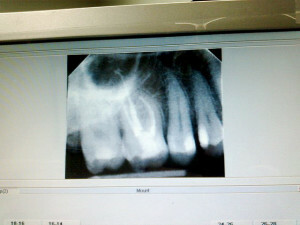 He will take an x-ray of your tooth, to give him a comprehensive view of the root canal, tissues, and surrounding bone. The x-ray helps him proceed with the treatment and perform the procedure flawlessly. Before root canal therapy begins, Dr. Norman administers anesthesia on the tooth to be treated. This numbs the area and makes the treatment painless and comfortable for the patient. He then places a rubber dam around the tooth, so the area is kept dry for the entire treatment. Dr. Norman drills a hole into the affected tooth. He then removes the infected pulp from inside the tooth’s inner chambers. He cleans and sanitizes the area, ensuring that the tooth is free from infection before placing a filling. Once the tooth is cleaned, it is filled and then sealed. Oftentimes, root canal therapy is followed by a dental crown, to offer the tooth strength and protection. Why Does a Dental Crown Often Follow a Root Canal Therapy? In the process of removing the infected pulp, tissues, debris, and blood vessels are likewise removed. This makes your tooth very weak. Thus, a dental crown often follows a root canal therapy, to completely cap a tooth and give it the strength it needs. Dental crowns are available in various materials such as metal, stainless steel, and porcelain. Dr Norman can discuss the various types of dental crowns so that you can make an informed choice for protecting your endodontically-treated tooth. What Are the Indications that Root Canal Therapy is Needed? Sensitivity to cold and hot foods and dishes even after the removal of the hot/cold item. Most patients nowadays claim that root canal therapy is actually a painless procedure that’s no different from having a dental filling. Dr. Kim C. Norman is skilled and experienced when it comes to root canal treatments, so you have nothing to worry about. He has performed numerous successful root canal treatments to patients in and around Maryville, TN. If root canal therapy is what you need, don’t be scared. This treatment will remove infection and bacteria from inside your tooth and make your tooth healthy again. Discuss this treatment today with Dr. Norman. Call to schedule a consultation at (865) 982-9662.